An exhibition featuring different artworks (video, photographies, ..) in relation to the perception and experiences of the artists over the city. Megafone.net has developed ten projects with different communities: Taxi drivers from Mexico City 2004, young gypsies in Lleida and León (Spain 2005), prostitutes in Madrid 2005, Nicaraguan immigrants in Costa Rica 2006, motorcycle messengers (motoboys) in Sao Paolo 2007, displaced and demobilized people in Colombia and young Sahrawi refugees in the Algerian Sahara 2009. Two projects were developed with people with limited mobility in Barcelona 2006 and Geneva 2008. For these projects, participants used GPS-enabled mobile phones to photograph obstacles and architectural barriers they found in the streets and to create a real-time, web-based accessibility map of their cities. Megafone.net is a platform which can be useful as an alternative medium of communication for groups, collectives and associations who wish to organize themselves in order to project their own views and opinions, and counterbalance the negative stereotypes that the mass media disseminate when referring to them. Among its features, you will find geo-localization, which allows the carrying out of digital public cartography projects. The Unité d’Habitation in Marseille, built by Le Corbusier in the 1940’s represents the beginning of a series of architectural projects concerning social housing with clear Utopian inspirations and a radical attempt to transform the common ways of life. We can state that Corviale —inaugurated at the beginning of the 1980’s— is, with all its complexity, one of the last conceptions of this transforming spirit which has finally been left to one side by the dynamics of market forces. 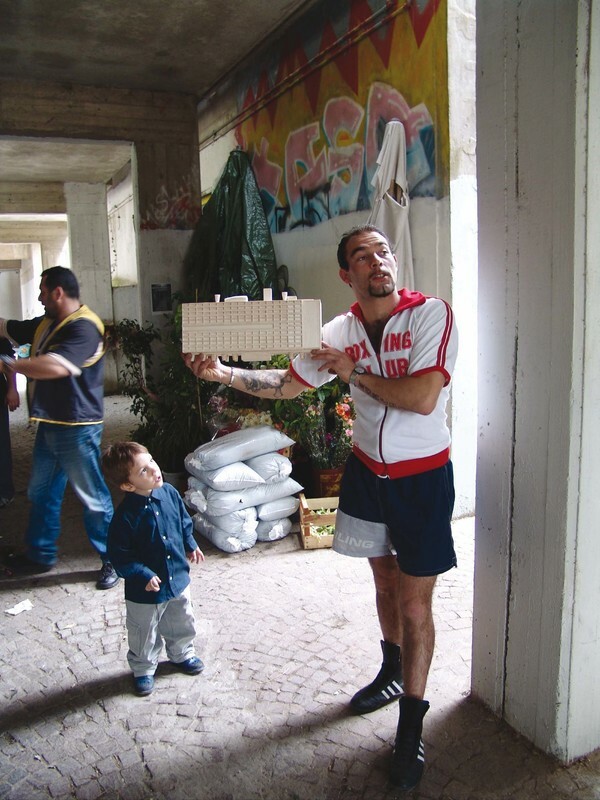 The Sostenere il palazzo dell’utopia (Holding the Building of Utopia) project consists of a series of portraits of Corviale’s inhabitants holding in their hands the model of the Unité d’Habitation in Marseille, recreating a type of democratic and egalitarian version of medieval imagery (where the powerful: popes, bishops and kings were represented holding the city they had founded), in a modest poetical attempt to re-found the possibility of Utopia. We set out to explore our immediate surroundings – the city – in an effort to understand it and incorporate it into our vital processes. We want to form relationships with the external complexity, foreign to our bodies and our internal processes. Territories undergoing transformation attract us because they are no longer the thing they used to be, but they haven’t yet become the next thing. Temporarily neutral spaces, battlefields in which global interests clash with local realities. These are places where we can move freely, play, name things our own way and signpost them. As we embark on our adventure, our own bodies are the interface for exploration. Based on our own experiences, we learn about ourselves and our surroundings. Setting off on a Safari to the Future, we explore the city until we reach the coast. Water and its environments – essential but inhospitable to humans – appears as a border to be crossed. To get to the nearby artificial islands, which were built as part of the enormous set decorations for Barcelona’s approaching bout of land speculation, we have to build a bridge using the wooden pallets and other materials we find nearby. But we know that when the construction work finishes and the spectacle begins, we won’t be able to walk around like this anymore. We start to conspire to find ways of getting here by sea in the future. We make a list of friends and acquaintances who can offer us access to this highest layer. We ascend at one point and from there we move as far as we can, eventually climbing back down to street level at a completely different spot. These routes are like secret overground channels. We set up a website where people can register their roofs, creating new nodes and joining the aerial community. We move through it, connecting these nodes and tracing aerial routes. For a time, utopia becomes reality. This constitutes a collective undertaking which seeks to rename and afford meaning to words that have lost their meaning. 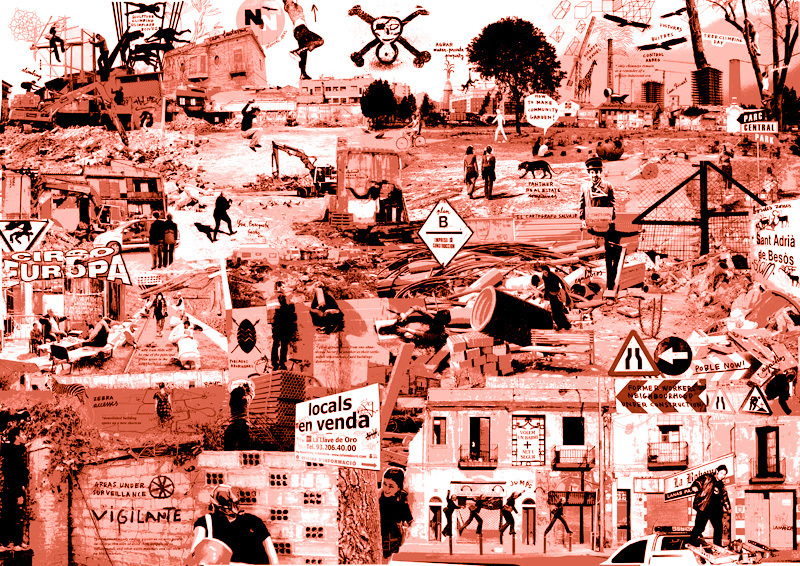 It is an endeavour which brings together myriad voices from across the city and includes individuals associated with the project REpensar Barcelona_REcuperar la Ciutat (Rethink Barcelona_Recover the City). The REpensar Barcelona (2005-2008) seminars are conceived as a forum for the exchange of knowledge and ideas. In the form of an open debate, the issues put forward for discussion include the problems of the contemporary city from its multiple dimensions: history, anthropology, architecture, urban planning, the economy, the environment, culture, local movements, etc. The objective of these discussions is to open up a process of debate and reflection on the different aspects of the urban phenomenon. We are rediscovering ideas and urban models that emerged in the past but have often fell into oblivion. These discussions also aim to create a meeting point for different people and associations from different backgrounds and also for interdisciplinary exchange. We hope to develop a common set of criteria and data to use as a base for voices critical of and alternative to the official model promoted by the city fathers. This project is part of the project “Community inconfessable“, curated by Valentin Roma at the 53rd Venice Art Biennale.